A couple of weeks ago, The 2016 American Speech-Language-Hearing Association (ASHA) Convention was held in Philadelphia. ASHA also brought along its Listen To Your Buds concert series and visited several local schools to educate kids on the importance of using technology safely to prevent permanent hearing loss. Hearing experts worldwide are detecting a disturbing trend indicating that noise-induced hearing loss is growing due to the unsafe use of personal audio devices, such as smartphones, and exposure to overreaching sound levels at music concerts, nightclubs, and sporting events. Noise-induced hearing loss is completely preventable, but once it occurs, it is irreversible. Who Suffers from Noise-induced Hearing Loss (NIHL)? ASHA has been proactive in delivering their “safe listening” message via the Listen To Your Buds campaign to younger children before they adopt bad (and loud) listening habits. ASHA does educate teenagers but wants to begin the conversation earlier to create a greater impact and to reach kids before the habit kicks in. Even mild hearing loss affects speech and language development as well as learning and the ability to communicate? Academically, hearing loss can affect reading and math? On average, children with mild to moderate hearing loss achieve 1-4 four grade levels LOWER than their peers? 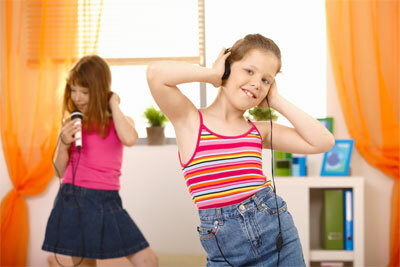 Hearing loss in children can lead to social isolation and poor self-esteem? It’s imperative that parents adopt the same “safe listening” practices that they impose on their children. Turn the volume down on your smartphone, take listening breaks, and wear earmuffs or earplugs in loud environments. If you suspect hearing loss in your child, please make an appointment with our audiologist. To learn more about causes and treatment, please visit our hearing loss page.